The city of Burlingame’s employee pension shortfall has swelled to an estimated $51.9 million — up 5.3% from two years ago — but that’s not the only bad news the city is facing when it comes to pensions. In addition to the total shortfall, the amount that the city is required to pay each year toward employee pensions is expected to grow to $13.5 million in the next 10 years — more than double the current $5.7 million. That’s a sizeable amount for a city that is expecting general fund revenues of $69 million this year. City officials are looking at a variety of strategies to get ahead of the rapidly rising payments, such as setting aside money in a dedicated fund to use when the increased payments kick in. The City Council heard a brief presentation on the issue on July 3 and is expected to have a more in-depth discussion in two or three months. The reason for the hefty spike in annual payments is because the California Public Employees’ Retirement System, or CalPERS, has revised the rate of investment return it thinks it will earn on pension contributions. In December, CalPERS lowered the expected rate of return from 7.5% down to 7.0%. With a rate of return of 7.5%, two-thirds of pension costs are covered by investment gains, according to city Finance Director Carol Augustine. But if the rate of return is lower, employers will have to contribute more to cover employee pension costs. Burlingame isn’t alone in facing the impact of CalPERS’ revised rate of return. Other cities, counties and school districts that participate in the retirement system must grapple with the same issue. CalPERS will phase in the reduced rate of return over three years. “We’re committed to making sure the changes are implemented in a phased approach so our employers and affected members have time to plan their budgets responsibly,” CalPERS Board President Rob Feckner said in December. Burlingame has identified several possible ways to start getting ahead of the CalPERS payments. One option — which CalPERS encourages — is to pay the retirement system extra money on top of the required annual payments. Under a CalPERS program called Fresh Start, the higher amounts would be locked in. Alternatively, the city could make additional discretionary payments to CalPERS without changing its scheduled payments, according to a list of alternatives drawn up by Augustine. If the pension shortfall is paid sooner, the city would save money on interest charged by CalPERS. The city could tap its general fund reserves to help pay off the pension costs, Augustine said. Or the city could borrow money for pension payments by issuing bonds. Burlingame has pension bonds outstanding from a September 2006 issuance of close to $33 million. Placing funds for pension payments in an internal reserve would provide the city with maximum flexibility, since how the money would be spent wouldn’t be “set in stone,” Augustine said. Setting aside money in a fund called a Section 115 Trust, which would be reserved for pension payments, would give the city more options on how to invest the money. 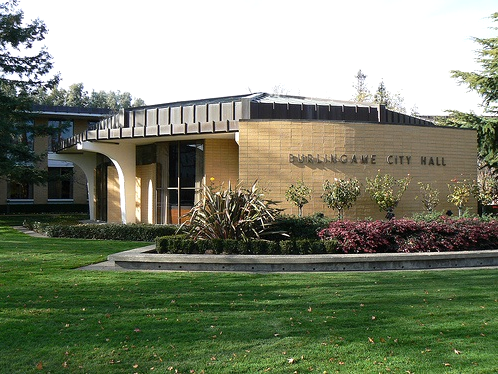 In its budget for the fiscal year that started July 1, Burlingame set aside $3.7 million to use in one of the yet-to-be selected pension strategies. Councilwoman Donna Colsen said the city has no choice about paying for the pensions. “These are the retirements of the hard-working people that are keeping you safe, that are fixing your sewers,” Colsen said. And Colsen said she was shocked to see that the city’s pension shortfall had grown. The $51.9 million pension gap that was calculated last month has two components: $21.7 million for public safety employees and $30.2 million for other city employees. The unfunded portion of projected pension payments is 26% for public safety employees, up from 24% two years ago. For other Burlingame employees, the unfunded portion is 24% of the projected pension total, up from 23% in 2015.